In 2010, with the addition of the second outdoor arena, MHR established our “Heroes on Horseback” program. 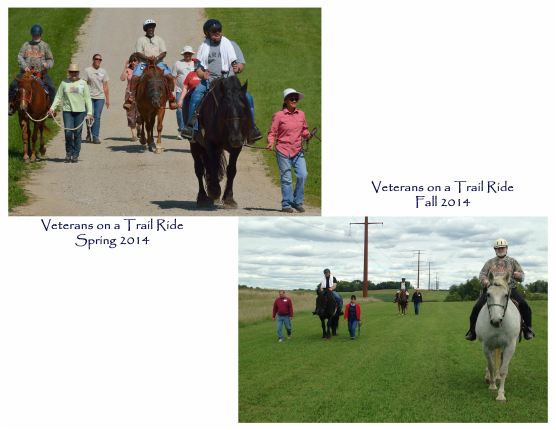 We made the commitment to bring the same benefits of equine assisted activities and therapies to our Veterans who have sacrificed so much to keep us safe as we offered to our children and young adults with special needs. Veterans may return from combat with negative self-esteem and an immeasurable amount of guilt that they take back with them to their “ordinary” lives. Unable to deal with the stress they have been exposed to, often they have nowhere to turn and talking about things just seem too unbearable. While traditional therapy includes medication and talk-therapy, complementary therapies may now include equine assisted activities, including therapeutic riding. Equine assisted activities and therapies are essentially different from other forms of exercise because it utilizes the three-dimensional movement of the horse to mirror movement in the human body. It is effective because it connects the physical, mental, psychological, and spiritual elements of healing. When initially introduced to the horses in this program, the horse can sense the negative self-value these people can carry with them. The horses will keep their distance; often turning away from these veterans as though they do not support the negativity. In time, when the veteran begins to verbalize positive self-talk, and even hold their body in a way that promotes more acceptance, the horse will slowly come towards him. In time, the horse and veteran become interdependent, allowing a sense of caring for one another. This friendship does not require that the veteran relive the traumatic experiences from his time in the military. With the horse, rehabilitation becomes a joy rather than a chore. If you know of an Armed Forces Veteran that could benefit from the services Majestic Hills Ranch provides, or if you know of someone who is interested in volunteering and assisting the veterans through their riding sessions, please have them contact our Heroes on Horseback executive director, Larry Johnson [mailto: LJohnson@MajesticHillsRanch.com].